A surprisingly tasty, yet healthy, alternative for your fry craving. Use marinara sauce, ranch sauce, or your favorite dipping sauce to finish off this tasty snack. Season zucchini pieces with salt. Mix panko bread crumbs, Parmesan cheese, and Italian seasoning in a bowl. Dip zucchini pieces into the beaten eggs and then press into bread crumbs to coat; gently toss between your hands so any bread crumbs that haven’t stuck can fall away. 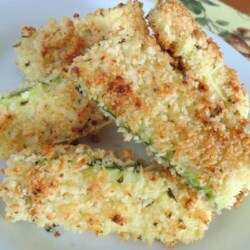 Arrange breaded zucchini onto the prepared baking sheet in a single layer. Bake zucchini in preheated oven until golden brown, about 15 minutes. Thank you to www.allrecipes.com for this scrumptious snack! for more yummy yet healthy treats, make sure to check out their website.